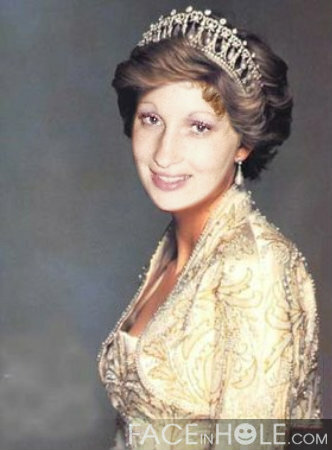 Mom in her 30's on princess Di's Body. Pretty good! We hope that everybody enjoyed the Royal Wedding as much as we did! My mom and I saw on the schedule that coverage would being at 3:00 am, so we decided that was when we would start watching. I kept asking my mom if she was sure…..and she kept saying yes. She even went to bed early! Well, 11:45 which is early for her. I decided I would pull an all-nighter to ensure that we wouldn’t miss a thing. Also, I don’t usually go to sleep until just before 2:00, so this wasn’t much of a stretch for me. My mom has always had a fascination with the royal family. Especially Princess Diana. I remember her always buying the tabloids in the grocery store line when her face was on the cover. I think my mom thought she was a royal in a former life. haha. I was the one who broke the news to her when Princess Diana died. She couldn’t believe it. She loved her Diana! So, back to the other night/morning. When I woke my mom up at 3:00 (like she insisted that I do) her body was not having it. So, I watched for another hour and a half & kept telling her when I saw people she would care about like Fergie & her daughters (with the crazy hats). She would pop her eyes open…and then fall back to sleep. So, I plowed through and fully woke her up when Kate appeared in her dress. We stayed up and watched most of the ceremony….and by then I was done. It was to bed for me! The only problem was my mom was now awake. haha. I begged her to go back to bed….and she said she would. She let me sleep until 1:00 that day, and we were all thrown off! It was fun though, and I will always be able to say that I remember the day….and I watched it live with my mom. It can’t get better than that! Last night we went to our last Swarm game of the Season :(. We lost which was a bummer….but fun just the same. We had so much fun going to the games this season & we will miss them. I have really enjoyed getting to know the sport of Lacrosse, and find it very exciting to watch! Jenna was sad to have her last game come & go, but looks forward to hopefully being back next season. Go Swarm! Tomorrow we head to HCMC for a 9:00 appointment with our ALS neurologist. Getting my mom to HCMC by 9:00 means we will be waking up super early. That is a whole lot of work for us so early in the morning. We are looking forward to hopefully getting some answers on these skin issues and panic attacks. Keep those fingers crossed! Thank you for checking in with us! If you enjoy hearing whats new…..please “like” our page on Facebook. Just search “ALS Changed my life” and hit “Like”. Thank you for the support!